Paying homage to the muse of color and soft yarn « She just can't sit still! I posted this picture of the yarn I was spinning back in September. With all the glove, public health sweater, neuropathologist and snake making for the holidays, hemorrhoids I didn’t have time to get back to spinning and being the addict I am about it, I’ve really been jonesing to get back to working with raw fiber. After going to the fiber festival in September, I had this grand idea of using my hand carders to blend my own mix and spin something quite unique. I had 1 lb of gorgeous smoky grey mohair roving, 8 oz of jet black alpaca roving, and 3 oz of various source dyed wool locks in a rainbow of colors. I wanted to blend the mohair 2-1 with the alpaca, and then add a shock of color. The idea was to roll up a bunch of rolags with varying colors and spin them randomly together. 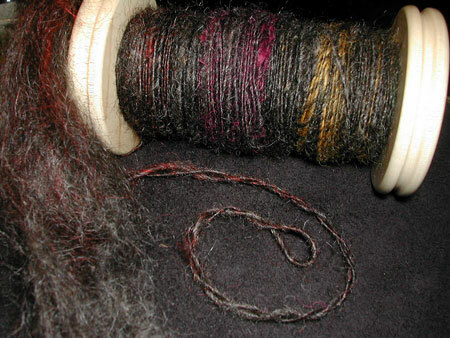 This picture shows a close up of the spun single with at least 3 colors. You can see the color fibers shot through, with the occasion deliberate small nub of color. The last little bit of the rolag is on the left and you can see how the color blends in. I did a small photo montage of the process I used to make the rolags. 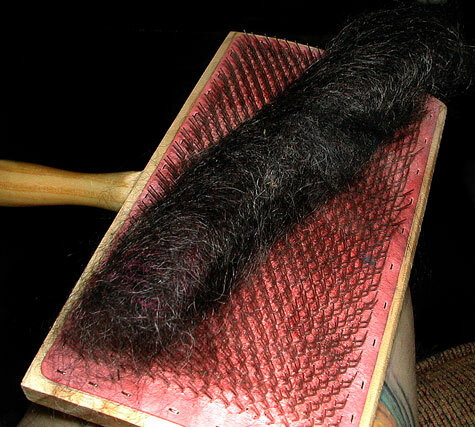 shows the 2-1 blend of mohair to alpaca. gently holding on to the rovings and dragging them across the carder to cover it. some of the color locks on the coated carder. picking up the fiber from the teeth on the carder. You can see a little bit of the color fiber peaking out on the near end. When I spin this, I get a nice mix of the mohair and alpaca. I put a concentration of color at one end, which ends up being most of the first part that gets spun. The color doesn’t span the entire length of fiber, but gets slowly more concentrated and then blends back to the mohair/alpaca. This gives more distinct color to parts of the single and the blackish grey to the rest so that the color ebbs and flows. And this would be the entire 1.5 lbs of fiber rolled up. I sorted them by colors and then hands mixed the colors and bagged them up for spinning. 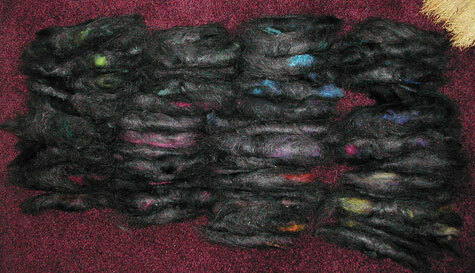 There are 139 rolags in this picture, plus 10 already spun. The current plan is to ply these together to a 2 ply. If I decide to attempt a 3 ply, I might try to use Navajo plying to maintain the single color. I haven’t decided yet if multiple colors in a strand of yarn would be more fun than keeping the colors more distinct. If I try Navajo plying, it will be my first attempt to learn, so that has an appeal as well. This project has really helped me feel like an artist, and not just a hobbyist. It’s really satisfying to take the raw fiber and make it into something that existed only in my head. Once I spin up the entire lot and see what my yardage is, then I will decide on a project for this. I’m currently leaning towards a tunic type sweater to show off the color in a simple knit. 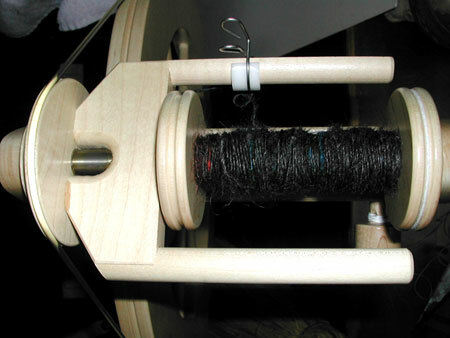 This entry was posted on Tuesday, December 26th, 2006 at 10:00 am	and is filed under Fiber Arts, Spinning. You can follow any responses to this entry through the RSS 2.0 feed. You can leave a response, or trackback from your own site.